When the “Red Wave of 2010” swept across America, Tawana Walter-Cadien knew how dangerous it would be for our country. With a clear sense of the threats that were coming (which we are now lamentably living through), she began fighting for us by working to protect healthcare reform. She knew that lives were on the line – yours, mine, our loved ones’, and the lives of total strangers we’ll never know. She didn’t wait until the worst thing imaginable happened to try to unseat her district’s unresponsive at best (and abusive at worst) representative, Michael McCaul. When Republicans took control in 2011, they came after health reform* right out of the gate. Tawana – a Registered Nurse, healthcare administrator and case manager, and public health educator – declared her candidacy. She didn’t wait for a favorable political forecast, or rumors of a Blue Wave. She didn’t shrink from challenging one of the best-funded and wealthiest men in Congress. She has fought for us all these years. She fought for us when people dismissed her fight as one that no Democrat could ever possibly win. She fought for us with virtually no financial support from the Democratic Party and no media coverage. Our base complained that they never saw her on the news, or that she wasn’t in their particular part of the District often enough, forgetting, if they’d happened to hear about it in the first place, that our gerrymandered district was one of the poison fruits of the GOP’s deplorable and outlandishly partisan redistricting in the wake of the 2010 Census. I’m ashamed to admit that I was just a voter until the 2000 election. I was well informed, and I did my civic duty, but that was it. It took something truly horrific happening for me to do more, and to become more. The Supreme Court decision in Bush v. Gore was that something, but I was so very tardy. I’m not sure who first pointed out that every generation has to lose its political virginity, but I finally lost mine in 2000, and there’s no excuse for it taking me that long. I’m a nerd. I knew then, as I know now, that science doesn’t work that way. But I was busy, you see, making friends for the first time in forever, having fun, falling in love, and being happy. Then 2000 happened, and I got active online and in the streets, and I stayed active. When Tawana Cadien sounded the alarm in 2011, I still refused to step out my personal nerd comfort zone – banging away behind a keyboard, or hollering my lungs out as just another face in the passionate political crowd. I didn’t rush to run beside her. I didn’t volunteer in person. I did my nerd thing, then I did my civic duty, but that was it. I may have done a tiny bit more than most, but I did it with a care for my comfort, and that was not what she needed from me. Primal scream therapy does not elections win. I will not fail her again. I have offered her everything that I personally have to give – my time and talents. I let her tell me what she needs me to do to help her win; and then I do it. Tawana has earned my endorsement because she knows the most important thing my parents ever taught me: Even if you’re not sure you can win, you have to do your best to fight for what is right. You can’t be a good person if you don’t. You have to fight to win, be willing to lose, and still keep right on fighting. It’s not over until you win… and even then, you must always guard your victory with zealous vigilance. Tawana Cadien is The Woman I Wanted To Be When I Grew Up, and I endorse her for US Congress, Texas District 10 (TX-10). I’m Tammy Talpas, and I approve this message. 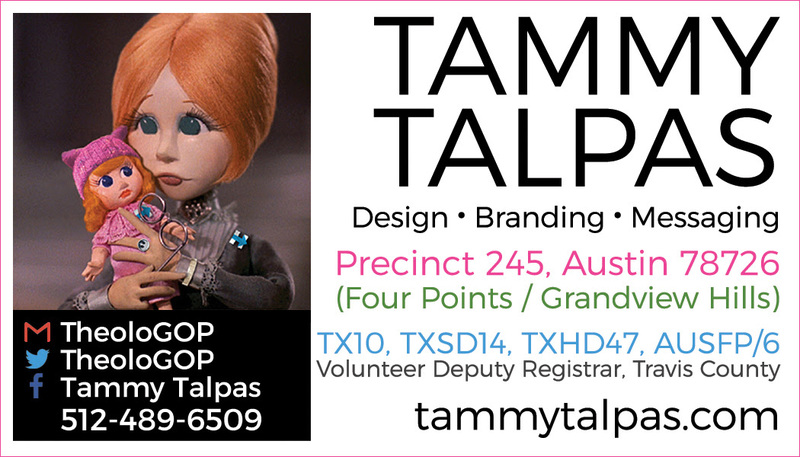 For more information, contact Tammy Talpas at (512) 489-6509.